Since May 25, 2018, a uniform regulation for the protection of personal data has applied throughout the European Union: the EU General Data Protection Regulation. Companies in particular had to – and still must if they haven’t yet – deal intensively with the subject. This especially affects companies whose focus is on digitised business processes. 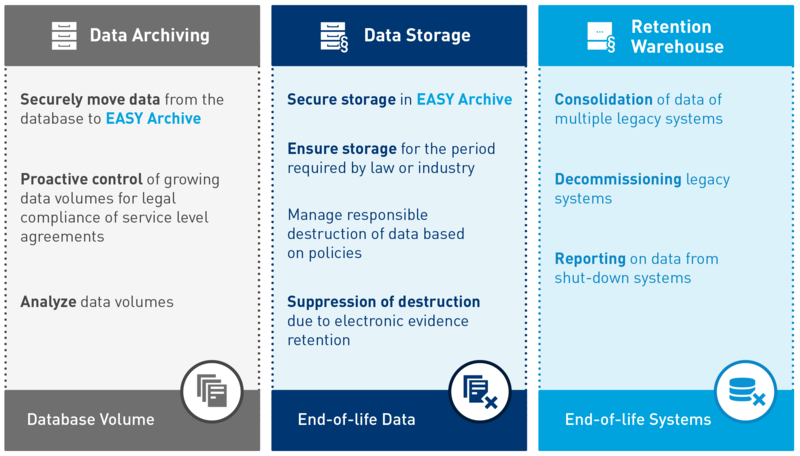 Do you use EASY Archive in combination with an SAP ERP system – and are therefore required to archive in compliance with the GDPR? Then your search is at an end. EASY SOFTWARE has the right interface between EASY Archive and the leading SAP ERP system: EASY WebDAV for ILM. Do you want to know how EASY WebDAV for ILM works in combination with SAP ILM? Many if not most data in numerous places in SAP have a personal reference or can occasionally be related to people. Master data such as the central business partner, the customer, supplier and employees generally contain identifying characteristics, such as name, address and phone number. Therefore, these data and documents in SAP are subject to the requirements of the Data Protection Regulation (GDPR). Learn more about General Data Protection Regulation (GDPR). As a result, the customer must implement technical measures which meet the requirements for the deletion or blocking of such personal data. These technical and organizational measures (TOM) specifically include the implementation of SAP Information Lifecycle Management – abbreviated SAP ILM. Learn more about SAP ILM. Ideally, your SAP system already supports SAP ILM. You can find further requirements for the smooth use of EASY WebDAV for ILM in the following overview. What are the requirements for EASY WebDAV for ILM? All personal data have a lifecycle. SAP Net Weaver ILM (SAP NetWeaver Information Lifecycle Management) adds the ability to manage the lifecycle more productively and to control archived data and documents based on rules to the standard SAP delivery. SAP NetWeaver ILM uses expanded data archiving functions specific to SAP ILM. With the use of EASY WebDAV for ILM as an extension to SAP ILM, you gain the ability to conform with all comprehensive requirements for the mandatory implementation of the GDPR. In particular, EASY WebDAV for ILM meets the requirement for providing ILM-capable storage for archive data and archive documents. 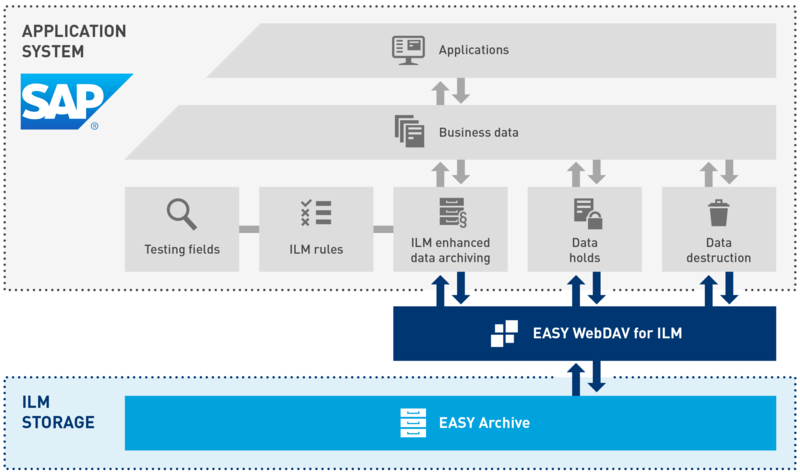 The following illustration shows the interaction of SAP ILM, EASY WebDAV for ILM and EASY Archive. 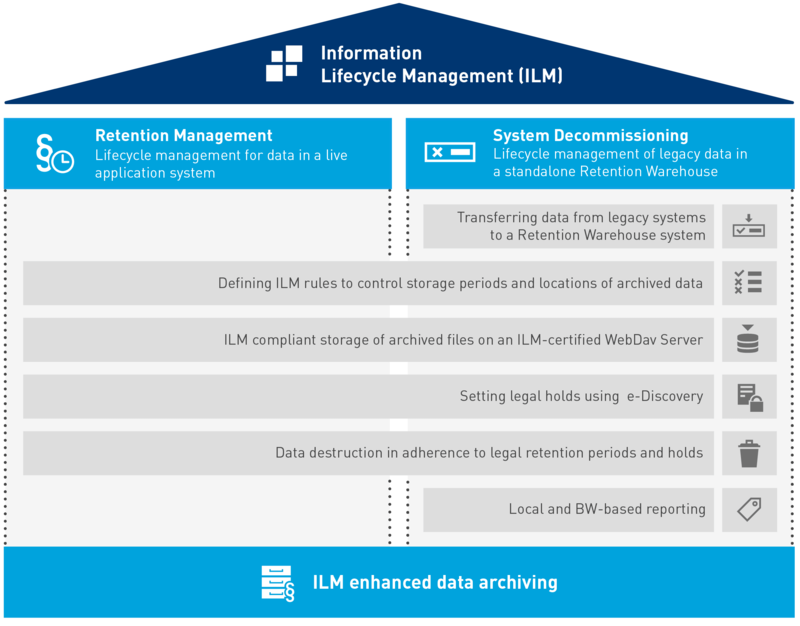 What does EASY WebDAV for ILM do for the information lifecycle management in EASY Archive? With the creation of a comprehensive blocking and deletion concept, the definition of a valid lifecycle management of data and documents and the use of SAP ILM, the company receives the ability to meet the requirements for the mandatory implementation of the GDPR. That way, fines for specific violations of data protection are permanently avoided and financial risks are minimized. What makes EASY SOFTWARE stand out?